The Al Jazeera headline above is misleading and would be way scarier if corrected: It’s not an “Ebola drug” being tested on Africans, it’s a completely unrelated drug (a heart medication) that some Italian NGO decided unilaterally also works against Ebola, even though it doesn’t and there’s no evidence to support that claim. British medics are saying that they think the use of this drug is actually killing more patients with Ebola, and the British government demanded that the Italians stop using it. It was also not approved for use by the local government. As the Liberian author of the Al Jazeera piece says, abuses like this are exactly why locals don’t trust “Western medicine” in the first place. From the colonial era to — as she discusses — Tuskegee and Guatemala, or even to the more recent fake CIA vaccination program in Pakistan, there are simply a lot of good reasons for the poor and vulnerable populations of the world to fear medical “assistance” from Western governments and doctors. This disgusting abuse in Sierra Leone is only likely to worsen that fear, even as local medical facilities and staff have been completely overwhelmed and outsiders have become necessary to halt the outbreak. Moreover, the author notes that Ebola has been around since 1975, so “urgency” is hardly a valid excuse to throw all the ethical rules of drug testing out the window. If you want to consider this Ebola outbreak as a minimal standards stress test for a response by the World Health Organization to a giant flu pandemic (or zombie apocalypse! ), the answer is “Yep, we’re all going to die,” according to a huge investigative reporting article by the New York Times last week. True, U.S. health professionals and others have noted that if Ebola emerged in the United States (or another industrialized nation), it would almost certainly be controlled quickly because of generally greater access to and availability of controlled care, as well as the C.D.C.’s presence. Unfortunately, disease outbreaks and pandemics are far more likely to start in and rapidly spread through developing and underdeveloped nations, which lack both the C.D.C. and plenty of good hospitals. And that’s where the trouble starts. As the article reveals, the W.H.O. is severely under-staffed and under-funded, with just a fraction of the C.D.C.’s annual resources, despite theoretically advising the entire world. Their efforts to coordinate responses across national lines and even respond at all have been an omnishambles of lateness and ineffectiveness. Some of this is avoidable incompetence, but a lot of it comes back to the money issue. As it turns out, the W.H.O. gets only one-fifth of its annual budget from world governments (who have been cutting back anyway, following the global recession), which is a pretty disturbing testament to just how little governments spend relative to what they could be spending easily. The vast majority of the money comes from private donors, who nearly always bring an agenda with their contributions. This tends to force the W.H.O. to spend a lot of money on rarer and narrower diseases (or on non-contagious health problems associated with affluent living standards) than on basics like malaria and the like. Moreover, the only time the private donor money goes to help fight disease outbreaks is when the outbreaks are in a developed nation or a non-industrialized country that also has a lot of rich people and business interests. The prime example cited was how money flooded in to help control and suppress the SARS outbreak 11 years ago, because it adversely affected the commerce of wealthy businessmen in China, Hong Kong, Taiwan, and other spots around the region. Once the outbreak ends, so does the cash flow. Thus, the W.H.O. is underprepared and underresourced to combat disease outbreaks in countries with very low development, very high poverty, and not a lot of glamorous plutocrats willing to throw money at the problem. And since that’s where most of the potential pandemics are likely to break out and spread rapidly out of control, that’s not very re-assuring. Thanks, budget hawks of the world! Thanks, misguided philanthropists!﻿ You are why we’re all going to be eaten by flu-ridden undead hordes. Topics: Big Idea – Low-Income Banking Reform; 2018 and 2022 World Cups controversies revisited; Guest interview on the Ebola outbreak – Sara Laskowski, US Peace Corps, Guinea. People: Bill, Nate. Produced: August 29, 2014. – Big Idea: How could the U.S. reform and expand consumer banking services for local income Americans to reduce predatory lending and other bad practices? – Will sanctions on Russia and Qatar’s sponsorship of terrorism, among other problems, force the FIFA World Cup to change locations or schedules in 2018 and 2022? – Guest Interview: UD Alum and Peace Corps member Sara Laskowski discusses being evacuated from Guinea due to the Ebola outbreak. To get one file for the whole episode, we recommend using one of the subscribe links at the bottom of the post. All US Peace Corps Members in Guinea-Conakry, Sierra Leone, and Liberia are being evacuated indefinitely — disrupting dozens of projects across the region — due to the current West Africa outbreak of Ebola. My friend is one of them and she is not happy about it. Projects that have taken months of sweet-talking the authorities, grueling grant applications, planning every step of the way have to be left now – postponed indefinitely. Bags must be packed. Close of Service dates for volunteers preparing to leave will be moved up. Pre-service training has been stopped dead in its tracks for the recently arrived group of volunteers. Somehow, we must all find the words to explain to our friends and host-families the harsh truth that we are leaving and don’t know when we will be back. In that post, she discusses how Western abuses and then neglect have led to a cycle that is fueling a major outbreak of the very deadly and horrible disease. Centuries of White Western doctors abusing non-white populations under their “care” the world over has fostered a great deal of fear of outside help. The misinformation, distrust, and lack of education is unfortunate and causing this virus to spread, but it is not the fault of the Guinean people. The rich history of Guinea is pained by colonization, civil discord, military raids, failed communism and struggling democracy and has led to a general distrust of both the Guinean government and the Western world in general. The education system, 70% unemployment rate, and social structure sets people up for failure; there is nothing inherently unintelligent or incapable about Guineans. During my time here I have been constantly amazed at the rich linguistic intelligence I see on a daily basis — people are often fluent in 5 or 6 languages, while Americans struggle through their required 4 years of Spanish or French. Creative solutions and a tenacious energy run freely through villages and cities. Yet I fear that many back home reading about this outbreak imagine an uneducated country with religious zealots refusing to be treated. I imagine that these people cluck their tongues, sigh, and silently think that this would never happen in America. And they go back to their day without a second thought. 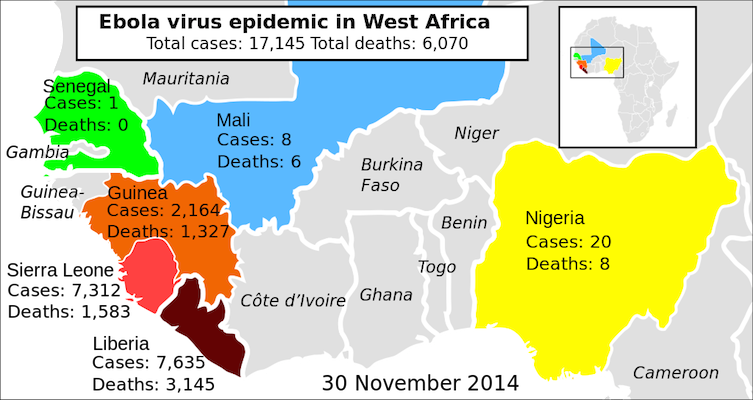 It was more likely, and still is, that people in Guinea would die of malaria or malnutrition than a deadly viral hemorrhagic fever. I remember calling my mother to dispel her fears. She’s a reasonable woman but even she imagined that I was living through some sort of ‘zombie apocalypse’ with infected patients roaming the streets looking to pass on their contagion. I encourage everyone to check out the full post for more insights.